Our facility utilizes a modern SCADA system. This system allows us to monitor and control our facility off-site. The SCADA system equalizes our daily flow, automatically wastes sludge from both aeration systems (based on real time MLSS) and performs many other monitoring and control tasks. We also have a camera system that is used for security and operational purposes. Two “Channel Monsters” rated at 4.0 MGD each grind our influent, before it flows into our main wet well. A second wet well, equipped with smaller comminutors, can be utilized if needed. Flow from the influent wet well is pumped by a combination of four raw sewage pumps ranging from .8 to 2.0 MGD in individual size. Under high flow conditions, 4 Equalization pumps each rated at 2.0 MGD, are utilized. An automatic, SCADA controlled, bypass valve sends flows over the plant flow set point to the equalization basin(s). The equalization basin drain opens and closes as needed to maintain a constant level in the influent wet well. Second stage waste, tertiary filter backwash, and sludge thickening channel decant is also routed to the equalization basin. This system balances hydraulic and organic loads into our plant. The second stage’s waste activated sludge is also pumped to the equalization basin where it provides some preliminary treatment. Under normal flow conditions only the first basin (.25 MG) is used for daily flow control. The first and second basin (1 MG) are concrete and aerated. The third basin (2.3 MG) is earthen. Each basin drain is automatically controlled by the SCADA system. Flow is pumped initially to 4 rectangular primary tanks, operating in parallel. Each tank is .055 MG (.22 MG total). Sludge is manually drawn twice per day and pumped directly to the primary digester. 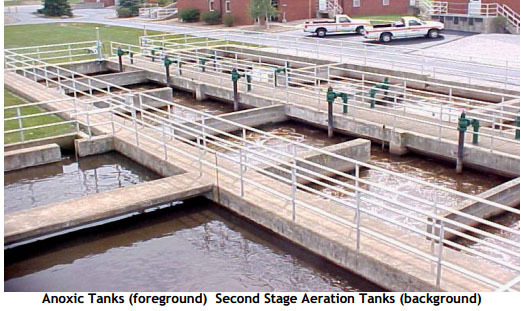 Both first and second stage waste activated sludges are present in the plant influent and are removed in the primary settling tanks. Flow from the primary tanks enters one of 3 trickling filters. The largest filter is 96 feet in diameter and has a flow capacity of 2.0 MGD. 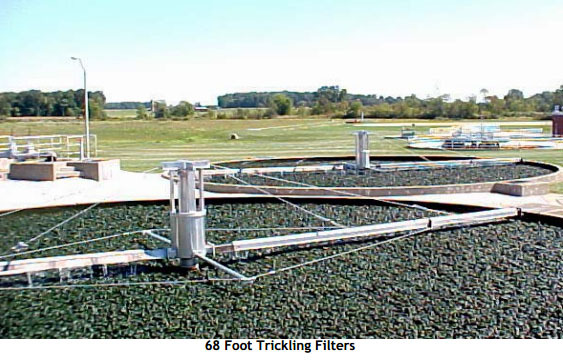 Two smaller filters are 68 feet in diameter and have a flow capacity of 1.1 MGD each. Flows in excess of 4 MGD are bypassed directly from the primary tanks to the first stage of activated sludge. Flow is pumped from the trickling filters to two 45,000 gallon anoxic tanks by two 1400 GPM pumps. The primary pump has a variable frequency speed drive which ensures constant flow to the anoxic tank and all other downstream processes. The anoxic tanks are gently mixed to avoid introducing oxygen. The first stage of aeration follows the anoxic tanks. This process utilizes fine bubble diffusers to provide oxygen to the bacteria. The 323,000 gallon tanks are baffled to prevent short circuiting. Dissolved oxygen and MLSS levels are constantly monitored via on-line instrumentation. MLSS levels are automatically maintained by wasting controlled by our SCADA system. 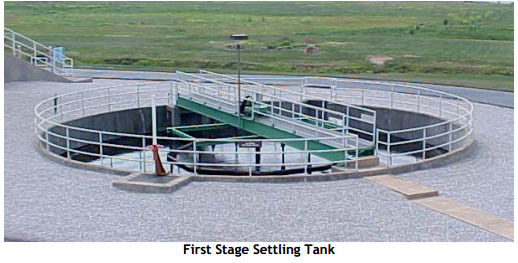 There are 4 first stage settling tanks (2 round 2 rectangular) with a total capacity of 301,000 gallons. Following the first stage, flow is lifted by screw pumps to the 327,000 gallon second stage. Fine bubble diffusers and instrumentation identical to the first stage is used in the second stage aeration tanks. Waste sludge from this stage is sent to the equalization basins where the bacteria have an opportunity to stabilize pollutants before being sent to the anaerobic digesters, after settling in the primary tanks. There are 2 (round) second stage settling tanks with a total capacity of 508,000 gallons. Flow from the second stage is lifted by screw pumps to two, dual media, rapid sand filters. The filters backwash based on time or head loss. Backwash water is sent to the equalization basins and eventually back to the head of the plant. Chlorine is applied ahead of the tertiary filters to reduce plugging of the filter media and for disinfection purposes. 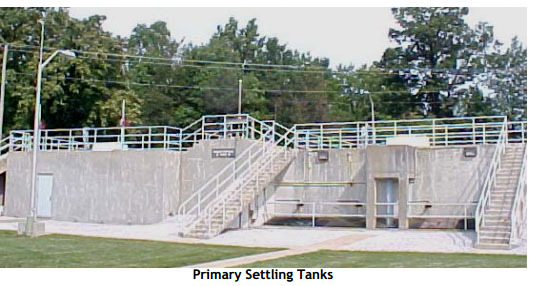 Two baffled chlorine tanks with a total capacity of 50,500 gallons follow tertiary filtration. After chlorination flow passes thru the 41,000 gallon post air tank to assure that effluent dissolved oxygen limitations are met. Oxygen levels and pH are monitored by on-line instrumentation. Just prior to discharge, sulphur dioxide is used to remove chlorine. Orrville has a municipally owned Power Plant which uses approximately 500,000 gallons per day of wastewater plant effluent for cooling water makeup. This system has been in place since 1995 and to date more than one billion gallons of water have been reused. Our reuse system benefits the environment and our community. 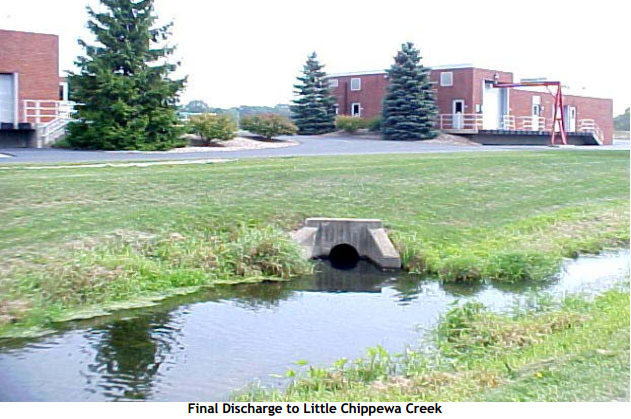 Orrville’s wastewater plant effluent discharges into Little Chippewa Creek. Our discharge makes up over 90% of this small streams flow. Little Chippewa Creek water eventually reaches the Gulf of Mexico via the Tuscarawas, Muskingum, Ohio and Mississippi rivers.